Eilidh is originally from the Argyllshire village of Taynuilt, where she was the youngest of four in a relentlessly musical family (her older brother is Donald Shaw of Capercaillie and Celtic Connections fame). Ewan began his musical career in Wales where he played in heavy metal bands. Eventually he earned enough cash to pay for a haircut and graduated to African Township jive, dance and electronica, and finally traditional and contemporary folk/roots music. A multi-instrumentalist he stepped into the coveted Shoogle mando slot in 2014, quickly becoming an integral part of the band’s front line and its tune-writing contingent. Malcolm’s whole life has been governed by serendipity. His journey from 1970s new wave combo Z and the Arabs to Shooglenifty has been blessed by a number of chance meetings, not least the first encounter with his future wife and her adolescent brother, the pot-bashing James Mackintosh. Originally from Orkney, Garry began his musical career at 13 , teaching himself to play guitar from old blues records. On moving to Edinburgh in the late 70s, he discovered the legendary sessions then going strong in Sandy Bell’s bar, where a surfeit of guitarists prompted the switch to the banjo. His often psychedelic improvisations remain rooted in that jam-session dynamic. The banjax, Garry‘s uniquely customised electric banjo was spurred by the urge to boost the instrument’s available warp factor, an ambition brought to fresh heights in the Shooglenifty sound. Hailing from the Scottish Highlands, James’s first forays into percussion were distinctly hand knitted. Fearing for the integrity of her pots and pans, his mother eventually bought him a drumkit for his 15th birthday. Some 30 years later James is widely recognised as one of Scotland’s most innovative drummers, and he is responsible for the deliriously danceable grooves underpinning Shooglenifty’s sound. 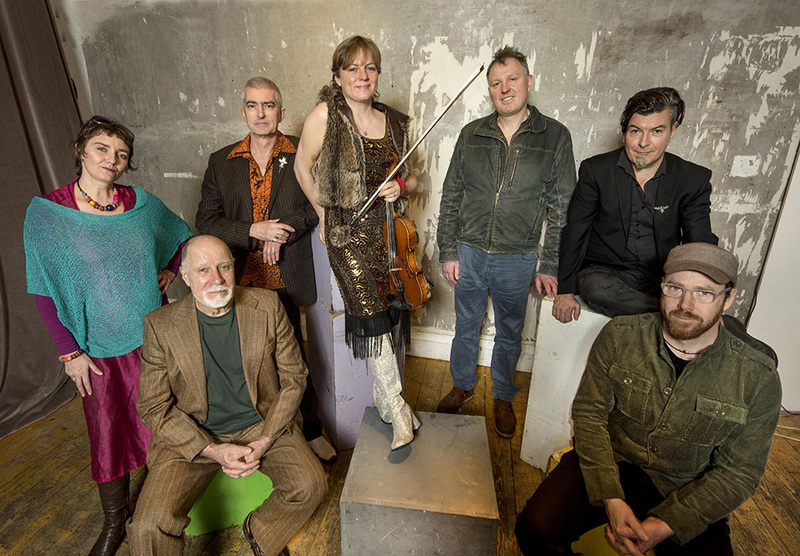 The Shoogle drummer is much in demand elsewhere: with Capercaillie, Grit Orchestra, String Sisters and Michael McGoldrick to name a few. Quee‘s characteristic funky style and previous experience working with James in Mouth Music and Rhythm Chillun meant he was the no 1 choice in 2002 when the band’s original bass player went on to pastures new. Not only is Quee a fabulous bass player he is also a composer of note recording music and soundscapes for dance and theatre. With two acclaimed solo albums under her belt, Kaela divides her time between her own band and providing vocals for Shooglenifty.